brrrrr. It’s so cold in Cleveland today all of my apple-picking buddies decided it was just too miserable to forge our way through the orchards. Instead, we settled into endless cups of coffee and Maryland Crabcake Benedict (amazing!!!!) at the Inn on Coventry, just around the corner from my lovely abode. It’s like a Pittsburgh Pamela’s but more creative and forth-coming with refills. Also, just as crowded. This would be so lovely right now, although my day’s productivity would surely plummet if I were wrapped up in this baby. 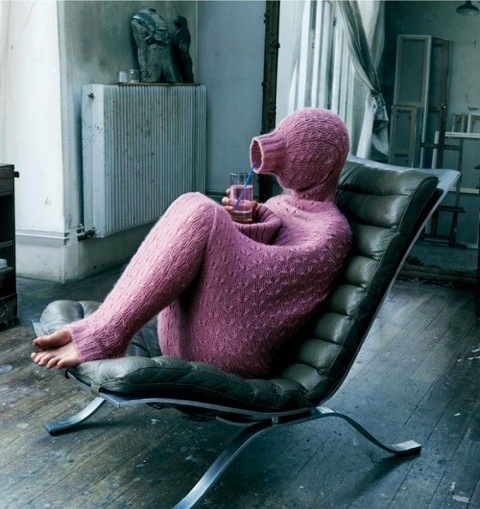 The puzzling thing: if we are to believe that this is a truly chilly person, dressed in this knitted body bag blanket, where are her slippers and cup of tea?! Ice water and exposed toes are no way to go this blustery first Sunday in October! Hahahhaah I love that thing.